Sega has officially acknowledged that trailers advertising Aliens: Colonial Marines "did not accurately reflect" the game. 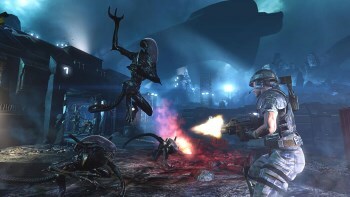 Remember how great those Aliens: Colonial Marines trailers looked? And then the game came out and people were all, "Wait a minute," because it somehow didn't look so great, and everyone was wondering what happened? Sega claims the discrepancies weren't actually its fault, but has now acknowledged that the promos are not an accurate representation of the game. Prompted by a complaint from Reddit user "Subpardave," the U.K.'s Advertising Standards Authority contacted Sega to inquire about the ads. "[Sega Europe] explained that their online trailers used demo footage, created using the in-game engine," the ASA said in a letter sent to Subpardave. "Sega Europe understood the objections raised about the quality of the game in relation to the trailers, but explained that they weren't aware of these issues when the trailers were produced, in some cases several months before release." "Sega Europe acknowledged your objection that the trailers did not accurately reflect the final content of the game," the letter states. "They agreed to add a disclaimer, both on their website and in all relevant YouTube videos, which explains that the trailers depict footage of the demo versions of the game. The disclaimer will be visible when each online trailer is played." The ASA "informally" upheld the complaint, publishing the resolution on its website, but as nice as a public admission to inaccurate advertising may be, its value is questionable at best. People unaware of the Colonial Marines fiasco who see that disclaimer are, I would think, far more likely to assume that the final product is better, not worse, than the promo. After all, you see "not representative of the final product" disclaimers on promo materials all the time; unless there's more to it than suggested by the ASA letter, how is this any different?